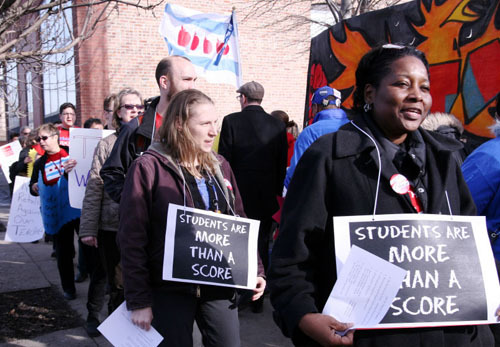 A rally of 200 parents, teachers, students and community activists was held outside the "Network 7" office of Chicago Public Schools on the afternoon of March 10, 2014, as teachers and parents continued the largest Opt Out in Chicago history. 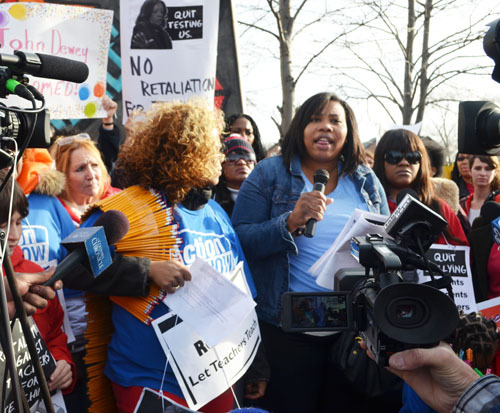 Groups of teachers at Saucedu and Drummond elementary schools have been boycotting the ISAT (Illinois State Achievement Tests) tests, while thousand of children have been opted out of the tests by their parents. Saucedo teacher Sandra Posadas speaks at the March 10 rally about why she boycotted the ISAT test. Substance photo by Sharon Schmidt.At the rally, people demanded that CPS officials stop harassing parents and teachers who are opposed to high-stakes testing and to the Opt Out. Since the testing program began in Chicago on March 3 and 4, teachers and parents have reported intense pressure to administer the test, despite the fact that it ends this year. The group tried to bring their concerns to the office of "Network 7" chief, Theresa Placencia, who has been one of the most obnoxious of the school system administrators in bullying teachers and parents about the ISAT. Plasencia refused to talk to the protesters, who left pencils on the Network Office fence. Speakers included parents and teachers. I made an informed moral decision to opt my son out of the ISAT. Why are teachers being punished for my decision? Is this what happens when you challenge the money. Parent Sherise McDaniel at the March 10 rally. Substance photo by Sharon Schmidt.Does the Board think that African American and Hispanic parents are not capable of making decisions for our own children. Do not let them insult us. I don't need the mayor and anyone on his payroll telling me how to raise my children. Barbara Byrd Bennet said time and time again that CPS would not use the ISAT any longer and that parents had the option to opt-out. My children's teachers and I have a job to do and that's educate my child and improve our schools on what little funds we have. I am very cautious now about testing � who is seeing the data, what are they using it for, who has it and when they're done, where does it go � because I have to protect my child. And with all the testing going on, who's learning, who's teaching? Let the teachers teach and the children learn! I am here and I am boycotting the ISAT. As an early childhood educator I believe the students � my bilingual students�are already over tested. The take the Benchmark tests, NSEA tests, ACCESS, ISAT, REACH. The ISAT doesn't count for achievement or growth. Funding is not being lost or withheld. The ISAT has taken time away from instruction so taking this stand against a week-long test was necessary. In order for me to be able to continue teaching and not waste time. The boycott ended up being a catalyst in bringing for public understanding to the nature of standardized testing. 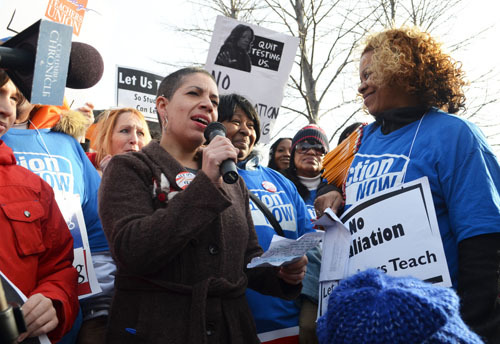 CHICAGO-The Chicago Teachers Union on Monday will host and anti-retaliation rally for families and teachers in their recent stand against the Illinois Standard Achievement Test (ISAT) in Chicago Public Schools. 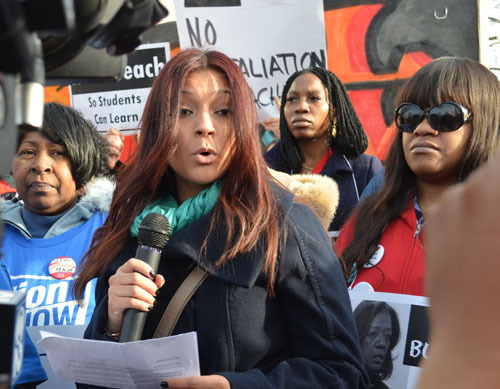 The rally will be held from 4-6 p.m. at the CPS Pilsen-Little Village Network office at 501 W. 35th St. in Chicago in support of the more than 1,700 students at 80 schools- including three charter schools-who were opted out of this week's ISAT, and joined teacher-led decisions to teach instead of test at Saucedo Scholastic Academy and Drummond Montessori School. WHEN: Monday, March 10, 2014. 4 to 6 p.m.
PRESS AVAIL at 4:30 P.M. Thanks, Sharon. I couldn't be there so I really appreciate your excellent coverage.